Eye surgery is usually performed to cure eye diseases such as glaucoma and to treat eye defects like astigmatism, near-sightedness and far-sightedness. Although there are other treatments that can be used for these conditions, the treatments are often temporary with a real cure being attainable only through eye surgery. But treatment of eye diseases and defects are not the only conditions for which eye surgery is performed and one of these is blepharoplasty eye surgery. What is Blepharoplasty Eye Surgery? 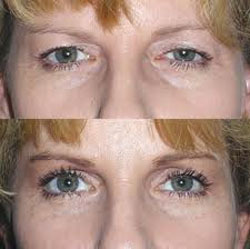 Blepharoplasty is a cosmetic eye surgery that is performed on the eyelid. It can either be done on the upper eyelid or the lower eyelid or even both. This is done by removing excess tissues in the eyelid and in some cases involves reinforcement of the muscles around that area. The aim of blepharoplasty is to give the eyes a more rested and youthful appearance and is used to treat the symptoms of aging around the eye. This procedure is also carried out on patients that have bags around their eyes and wish to get rid of them. This type of eye surgery is purely cosmetic and does not really affect the vision of the patient except where the excess skin from the eyelid hangs over the eye in which case, vision could be significantly affected. It is pertinent to note that not every patient is suited for blepharoplasty eye surgery. Certain factors are considered before blepharoplasty can be done on a patient. These factors can influence the success of the operation and they include the age of the patient, the skin quality, and looseness of the skin and whether the patient has dry eyes amongst others. These factors will be evaluated by the surgeon before a decision is made whether or not to go ahead with the surgery. The preliminary tests are carried out to ensure that the patient is a good fit for the eyelid surgery. Once that is determined, other necessary tests would also be carried out. Before the surgery, anaesthesia is administered to the patient to eliminate the pain from the process. This can either be general anaesthesia or some other kind, depending on the surgeon’s advice. Afterwards, incisions are made to the eyelid. Where the incision is made would depend on the type of work that is being done to the eyelid. The excess skin or fat in this area is then carefully removed by the surgeon and after which the incisions are stitched close. The operation is done in a couple of hours, three hours at the most. Although there is an initial swelling of the area right after the operation, this swelling usually goes down after a few weeks, leaving no scars in the area. An ointment is usually given to the patient for use right after the operation up to a few days after. There might also be some eye drops prescribed to keep infections at bay and also for pain management. Eye pads and sunglasses would be constant companions of the patient for a while. In the UK, the NHS scheme does not cover blepharoplasty as it is considered purely a cosmetic surgery. Costs fall around £2500 although it might be slightly cheaper or expensive in certain clinics. There are financing options available which might make it more affordable.